This family home has four bedrooms, a family bathroom, an open space kitchen diner and sitting room. The property comes with 3000sqm of land which contains various fruit trees, vineyards and a well. The property’s land is fully fenced and also includes some annexes that at the moment are being used as storage. The property also comes with a garage. The house’s bedrooms are lovely and spacious and they are all large enough to be double’s. All of them have large windows. The family bathroom is also of a good size with tiled flooring and paneling on the walls. There is a nice glass shower cabinet which gives the bathroom a modern and spacious look. As for the open space living area, there is a fully fitted wooden kitchen with a large window above the sink. The kitchen and dining/living room are slightly divided by a large and wide, wooden archway. In the living area there is an open fireplace and a large window. This house is definitely perfect to be used as a family home and is ready to move into as it is. There is no work need other than maybe some personal touches. The property is easy to access from the A13 motorway and is only a mere 9km away from the village of Dornes. The property has great views over the countryside. 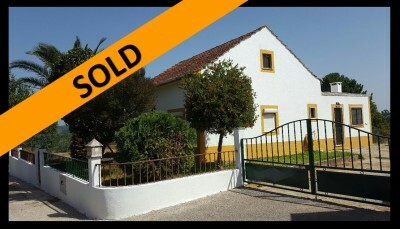 The property is around 14km away from the town of Ferreira do Zêzere which has all the basic amenities. The historic town of Tomar, which is home to the UNESCO listed Convento do Cristo, founded by the Templar’s crusaders is only 30 minutes’ drive from the property. All major European high street shopping is also available in the city of Coimbra the 3rd biggest city in Portugal which is only 40 minutes’ drive on the A13 motorway.